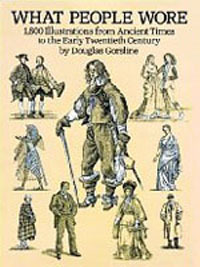 This is a picture book showing line drawings of garment fashions over the course of several centuries. The book focuses on European fashions, but does contain a section on ancient Egypt. Important note: This review focuses on this book's value as a resource for costuming for Middle Eastern dance. People interested in it as a resource for other purposes would probably evaluate it quite differently. This picture book was originally published in 1951 by Bonanza Books under the title What People Wore: A Visual History of Dress from Ancient Times to Twentieth-Century America. Dover Books now offers it in reprinted form. The book contains over 1,800 line drawings, with very minimal text. There are brief captions of 3-4 words at most identifying where and when each ensemble is from, and a few Historical Survey pages that offer a timeline of world events corresponding to the era of the costumes in each chapter. The section on costuming of the ancient world contains approximately 15 pages and covers Greece, Egypt, Assyria, Persia, Crete, Israel, Rome, and Byzantium, with most of the space being devoted to Egypt, Rome, and Greece. The European section is by far the most extensive section of the book, devoting 160 pages to the subject. Coverage begins with the ninth century and runs through 1918. The American section focuses mostly on the 19th century and offers such colorful characters as cowboys, lumberjacks, frontiersmen, fur trappers, and urban dwellers, with the most recent images corresponding to 1925. All of the illustrations in this book consist of detailed line drawings. You need costume ideas for a Pharaonic theater piece. You are looking for resources that show what European and U.S. attire looked like throughout history. You're an art student learning to draw the drape of clothing, and you'd like some images of people clad in a variety of garments to practice copying. You are planning to create or acquire a European-style costume for use in Society for Creative Anachronism (SCA) events or Renaissance Faires. You're researching the scandal surrounding "belly dance" in the United States in the 1890's and you'd like to see what the prudish American public was wearing at that time. You're seeking a source of information on historic garb of the Near East and North Africa. The drawings are very detailed. The book provides a rich source of information about European clothing of the Medieval and Renaissance eras. The book includes close-ups of hair styles, hats, and shoes. Every image is labeled by time period, social class, and country. The book contains an image of a French woman from the early 20th century wearing harem pants! The book provides a detailed bibliography, which should prove helpful to people who would like to explore the primary sources on which it is based. The book is almost entirely devoted to Europe and the U.S., with no coverage of cultures that would be useful to a performer of Middle Eastern dance. The information provided by the book ends with 1925. The book does not contain any footnotes to help readers link the images with the primary sources from which they were drawn. There is only the bibliography - someone seeking the source of a specific drawing will be looking for a needle in a haystack. I wouldn't recommend this book as a resource for performers of Near Eastern dance, because the only images of the Middle East or North Africa in this book are those dating from ancient times. For that reason, it's not useful as a resource in researching historical garb from that region, though it could be a helpful source if designing a Pharaonic costume. For those researching European or 19th-century U.S. clothing, the book is much more useful. The line drawings don't provide information on fabric color or weave, but they do offer actionable information about cut and drape of the garments. There is nothing to disclose. I have never had any contact with the people who created this book.